For the decisive race, Cecil builds a rocket propelled turtle shell that allows him to alternate between moving fast and slow. Bugs tries everything to destroy the device to no avail. As they near the home stretch, Bugs has no other option but to turn on the afterburners and speed past Cecil who has mysteriously decided to run slowly after turning off his jet propulsion. Bugs rejoices after sliding head first across the finish line, thinking he has finally bested his arch nemesis. In the ensuing conversation, Cecil goads Bugs into admitting rather loudly that he was “doing 100 easy” as he sprinted towards the finish line. 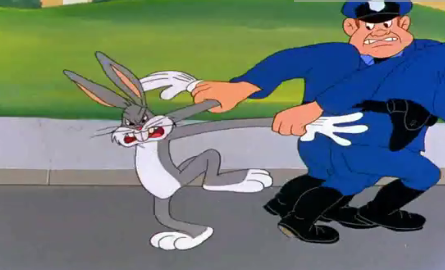 Moments after that declaration, we see two police officers standing next to a road sign that reads “30 mph.” Kicking and screaming, Bugs is dragged off to jail for speeding. Bugs learned the hard way that those who blindly speed their way through life to reach goals or to get rich quick with no regard for rules or proper standards of conduct will face consequences. As mentioned in the proverb above, there is no reward at the end for those who hasten to get rich. Slow, steady, faithful progress is the surest path to bring some form of blessing in the end. Questions: Where are you today in this journey? Are you ignoring details and turning a blind eye to the warning signs that are trying to direct you to a better place? How do you fight the temptation to cut corners in reaching goals or building wealth? 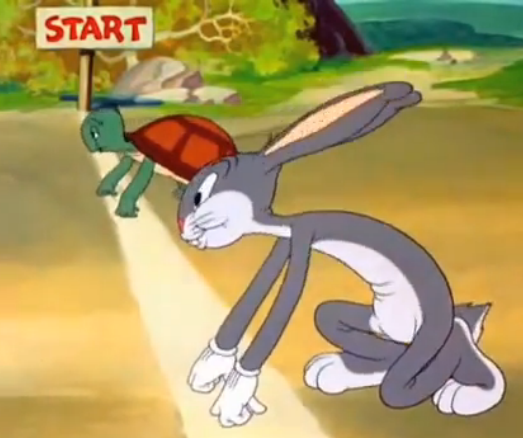 Any other lessons we can learn from the interaction between Bugs Bunny and Cecil Turtle? Great analogy for that proverb! I keep reminding myself of slow and steady when I get jaded with the journey. Funny, I had Bugs in my weekend post this week too! Wouldn’t we all rather have it now? It really is a journey of patience and discipline. After several missteps in my twenties I started to get my financial act together a few years ago. It has taken a lot of time and effort to get where I am today and at times I did get frustrated because things weren’t improving as fast as I would have liked. What I’ve learned is to appreciate progress at any rate and as long as I stay on course, continue to work & smart and remain true to my values and beliefs then I am set. When I get frustrated because things don’t move as quickly as I would like, I just have to remind myself that so much of it is out of my control. I also try to evaluate what I’m doing to see if there are areas where I could improve or make changes. But above all, I agree with you one has to stay true to their own values and beliefs…no compromising of one’s character just to get their quickly. A great reminder that slow and steady wins the race. We so often look for the get rich quick scheme or are too impatient to nurture projects/businesses/dreams/goals to success. Sometimes I get impatient and wonder why my blog numbers are the same as others, and then an opportunity pops up. And I realize that even though it may be slower than I wanted, I’m still gaining the traction and the opportunities will continue to come in as long as I keep moving forward. “…wonder why my blog numbers are the same…” I have sooo been there Shannon! When I start thinking like that, I go back and review my numbers from July 2012 when NOBODY was checking out my stuff. That helps give me some perspective and realize, yes…I am gaining traction. I feel like I’m a slow and steady wins the race kind of person right now. I’d love it if some huge project/opportunity came along which gave me an edge financially, but wouldn’t risk my morals or ethics to achieve that. “…wouldn’t risk my morals or ethics to achieve that.” That is where the danger lies. We should never cross that barrier that compromises our character and integrity.